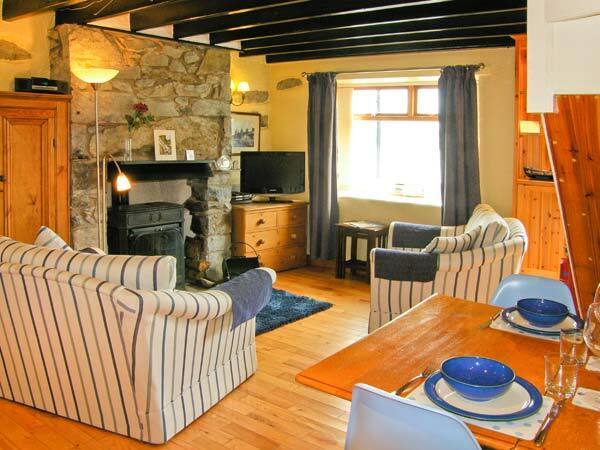 Colbha is a charming, detached cottage set in an elevated position, overlooking the beautiful Blue Flag Ballymastocker Bay, 1 mile from Portsalon and 5 minutes’ walk from the beach. With three bedrooms, one on the ground floor, along with a family bathroom and a ground floor shower room, up to seven people can enjoy this excellent holiday home. There’s also a kitchen, an external utility room, a sitting room with dining area and a small conservatory with excellent coastal views. Outside, there is ample off road parking and a lawned garden with patio, furniture, BBQ and patio heater. Just one mile away is Portsalon, whilst access to the beach is just a five-minute stroll away and delightful scenery abounds in every direction. Whether you seek stunning sights of the Atlantic, watersporting adventures, or simple days on the beach, Colbha is the perfect cottage for you! Gas central heating with open fire. Gas oven and hob, microwave, fridge/freezer. Fridge, freezer, washing machine and tumble dryer in external utility. Dishwasher, TV with basic Sky, WiFi. Fuel and power inc. in rent. Bed linen and towels inc. in rent. Ample off road parking. Lawned garden with patio, furniture, BBQ and patio heater. Sorry, no pets and no smoking. Shop and pub 1 mile. Blue Flag beach 5 mins walk. Note: Two steps up to access property.